Westhaven Delivers Gold-Laden Halloween Treats To Investors | Energy and Gold Ltd.
Spences Bridge Gold Belt explorer Westhaven Ventures (TSX-V:WHN, OTC: WTHVF) delivered a gold-laden halloween treat to investors this morning. 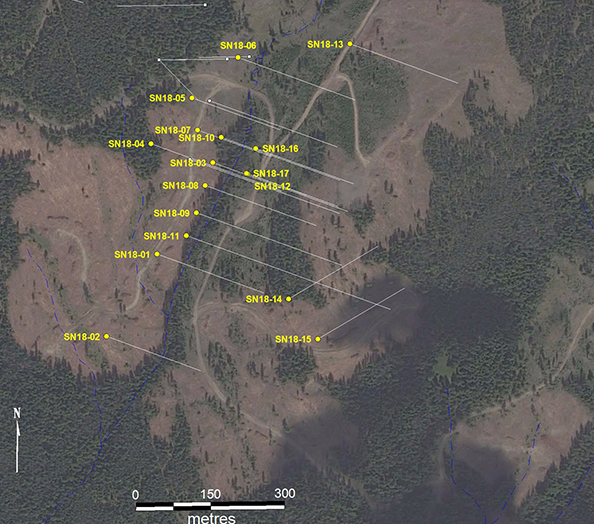 Westhaven reported hole SN18-15 from its Shovelnose Project in southern British Columbia, Canada; 18-15 returned 46.20 meters of 8.95 g/t gold (Au) and 65.47 g/t silver (Ag), including 5.00 meters of 14.70 g/t Au and 215.00 g/t Ag. This equates to 413.49 gram-meters gold and is now the second highest grade drill intercept on a grams-meters basis across the entire Spences Bridge Gold Belt, second only to Westhaven’s own hole SN18-14 which was reported two weeks ago. Westhaven is absolutely thrilled with the assays from SN18-15, and Westhaven CFO and head of corporate communications Shaun Pollard pointed out that it is highly unlikely that they’ve hit the two best intercepts in existence on the first two holes they drilled in the “South Zone”. In other words there’s a very good chance there is a lot more gold out there and they’re going to find it. In fact, the probability is that the best drill intercepts are ahead of them. 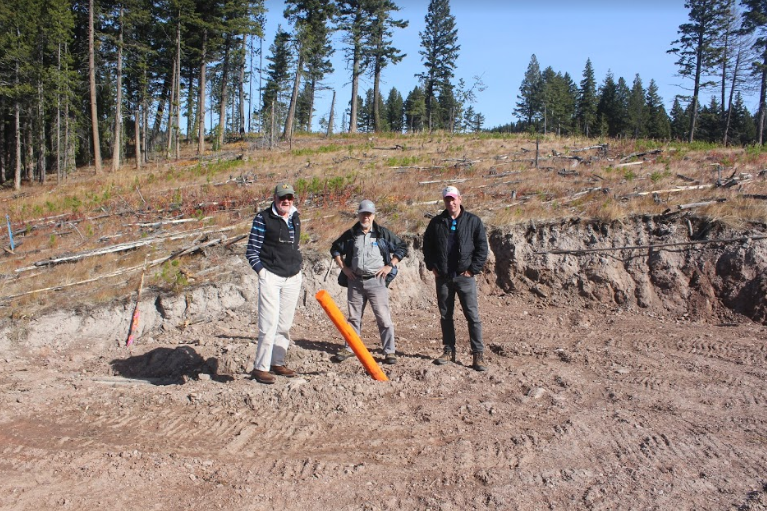 Now that Westhaven has drilled and received assays for holes 14 and 15, they can leverage this information to better target the potential higher grade gold. Westhaven Chairman & Founder Gren Thomas, Technical Advisor Ed Balon, and CFO & Director of Corporate Communications Shaun Pollard at the drill collar for hole SN18-15. Westhaven VP of exploration Peter Fischl, the Shovelnose mastermind who found the South Zone, thinks this system extends for kilometers. We know as a fact that the South Zone has a strike length of 700 meters and it is open to the east and the southeast. Westhaven isn’t wasting any time in getting back out to Shovelnose, where they can drill year round. The next drilling program will begin this weekend and consist of at least six holes totalling at least 2,000 meters. The next several holes will consist of overcuts and undercuts to SN18-14 as well as additional step-outs to the southeast from holes SN18-14 and 18-15. Westhaven is fully financed for this next drilling program and they will be running the drill rig 24 hours around the clock which means this program could be completed by early December. In addition, with the assays labs much less busy than they were in September Westhaven could potentially even get assays back for this next set of holes before Christmas. An airborne geophysical survey is also underway with results expected next week. Westhaven will then take some time to digest and process the data before turning it around and presenting it to the market. Westhaven is particularly interested in defined mag lows, well defined structures, from the airborne survey. It was an intriguing, well defined mag low that caused Westhaven to drill holes SN17-06 and 07 that led to the discovery of the South Zone vein system. Westhaven management also made it quite clear that they have no plans to do a financing at this point in time. However, if the right offer came along from a strategic partner then anything is possible – any potential partner would need to bring more than just money to the table. In the span of a couple of months Westhaven has gone from a sleepy C$10 million market cap junior explorer in a gold belt that nobody had heard of to one of the hottest stories in the entire junior mining sector with “everybody and their brother” beating down the door trying to give them money. One of the best parts of Westhaven is its management team and their corporate culture of meticulously putting shareholder money into exploration, don’t expect them to change what got them here. As Westhaven CEO Gareth Thomas told me in a recent interview “we’d rather let our grades do the talking”, Westhaven’s grades are doing plenty of talking for the company today.